The Salton Sea was created by accident. During a flood in 1905, inadequately built restraining levees along the Colorado River failed, allowing the full flow of the river into the dry alkaline basin called the Salton Sink. In the nearly two years it took to redirect the river, a vast inland sea, 45 miles long and 17 miles wide, was created. As the majority of California's wetlands have been developed, the Salton Sea has become a vital stopover point for the millions of birds that migrate along the Pacific Flyway. But the Salton Sea is dying, and in the process it is becoming a dangerous place for wildlife. The one-time fresh water sea has become increasingly saline. Temperatures that remain above 100f for nearly half the year have exacerbated the process of evaporation and concentration. At present, it is 25 percent saltier than the Pacific Ocean. Soon, it will be too saline even for the saltwater fish that were introduced in the 1960s. In addition, the sea occupies the channel of, and is fed by the Mexicali New River. This stream, flowing northward from Mexico, carries raw sewage, industrial wastes, pesticides, heavy metals and slaughterhouse remains into the sea. 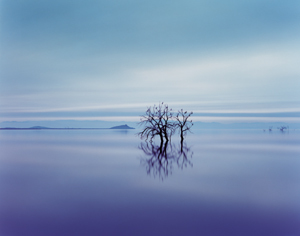 This photograph was made at the Salton Sea National Wildlife Refuge in January 1999. Officials there report that in the 12 preceding months, tens of thousands of birds and more than 2 million fish were found dead in the vicinity.